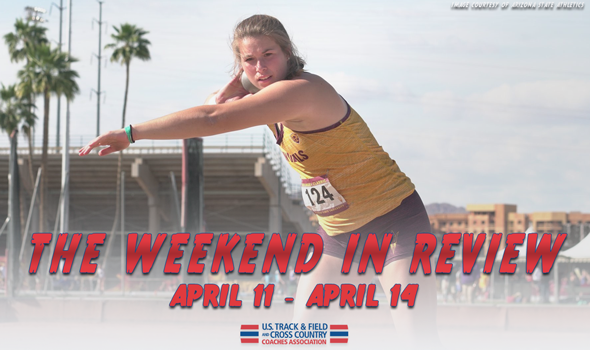 With the championship season quickly approaching it was another jam packed weekend for collegiate track & field as over 61 meets took place over the country in the past few days. And if it wasn’t for inclement weather that number would have been even higher! So with so much going on, how is one suppose to keep track of everything that happened this weekend? That’s where we have you covered as below features the highlights from another exciting weekend. All eyes were directed towards South Carolina’s Gamecock Invitational as student-athletes at the meet posted some of the top marks seen so far this outdoor season. On the men’s side, Demek Kemp of South Carolina State won the 100 at the event with a 10.03 which is the best time in the nation so far during outdoors. Ohio State’s Nick Gray took home the top prize in the 200 after posting a 20.20 and ran a 10.17 in the 100 which broke the 80-year old school record which was held by United States great Jesse Owens. It was quite the race in the 200 as Gray was able to outlast Clemson’s Marcus Parker by .13 seconds (now second overall in the nation) and his teammate Eric Harrison (who is now ranked ninth in the event) in a great final. Another great 200 was ran by Andre Ewers of Clemson who came in at third overall (20.40) after his showing at the Crimson Tide Invitational. Quincy Hall of South Carolina kept the show going for the host school at the Gamecock Invitational as he won the 400 with a 44.53, the top-time in DI nationwide. His teammate Isaiah Moore captured the top spot with a 13.25 in the 110H which is also the top time in the country. The host’s Yann Randrianasolo also tied for the national lead in the long jump after winning the event with a best of 8.07m (26-5.75). At the same meet the Ohio State 4×100 unit ran the sixth-best time so far this season with a 39.16. The performance was good for the top collegiate showing during the race as the Buckeyes were defeated by two USATF High Performance professional teams. Sticking to relays, the South Carolina 4×400 group also posted the fourth-best time overall (3:03.33). Wadeline Jonathas of South Carolina made it a show on the women’s side of things as she ran the second-best time in DI this outdoor season in the 400 after posting a 51.56. Yes, there were other meets going on and even more standout performances were had across the board by men’s and women’s programs. Jordan Geist, the Arizona Wildcat, tops the nation once again in the shot put after launching a best toss of 21.59m (70-10) to win the event at the Triton Invitational. It now makes the standout sophomore the 10th-best performer in the event in DI history. Right behind him was Dotun Ogundeji of UCLA who is now third in the country after winning the event at the Rafer Johnson & Jackie Joyner-Kersee Invitational (21.05m, 69-0.75). Iowa’s Reno Tuufuli is also third overall in his event after winning the discus (62.64m, 205-2) at the Musco Twilight. Mississippi State’s Marco Arop is the top-ranked athlete in the 800 (1:45.50) after winning the event at the Crimson Tide Invitational. At the same meet, Shelby McEwen of Alabama had the fourth-best performance this year in the high jump (2.22m, 7-3.25). Penn’s Marc Minichello was competing at the Tennessee Relays where he posted the fifth-best mark so far in the javelin with a best chuck of 72.45m (237-8). Also at the meet, TJ Lawson won the decathlon with 7,876 points which is the second-best total so far this season. To jump over to the women’s side, Samantha Noennig of Arizona State became the seventh-best performer of all-time in the shot put (17.81m, 58-5.25) after winning the event at the Triton Invitational. It is the top mark posted in DI this season. Abby Steiner of Kentucky ran the second-best time in DI this year with a 22.81 to win the event at the Tennessee Relays. Kentucky’s Kianna Gray was just behind her in posting the fourth-best time overall (22.87) to take second. Also at the meet, Nia Akins of Penn outkicked Abike Egbeniyi of Middle Tennessee State 2:03.76 to 2:04:04 to win the 800 as the pair now sits fourth and sixth overall, respectively. The Tennessee Relays also showcased the No. 2 and 3 100 hurdlers in the nation so far as Faith Ross of Kentucky edged Alexis Duncan of Tennessee by .01 seconds (12.89 to 12.90). The field also produced three more weekend standouts in Incarnate Word’s Sarea Alexander, UCLA’s Alyssa Wilson and Iowa’s Konstadina Spanoudakis. Alexander is now second overall in the long jump (6.60m, 21-8) and sixth in the triple jump (13.42m, 44-0.5) after winning both events at the UIW Invitational. Wilson now ranks second in the hammer (70.63m, 231-9) and is sixth in the shot put (17.10m, 56-1.25) after picking up the victories in both events at the Rafer Johnson & Jackie Joyner-Kersee Invitational. Spanoudakis sits at fifth in the discus (57.95m, 190-1) after taking the top prize at the Musco Twilight. The nation also saw some great performances in the 1500 this past weekend. The best came from Waleed Suliman of Ole Miss who is now the second-ranked men’s athlete in the event (3:40.49) after winning at the Joe Walker Classic. There was also a good battle on the women’s side in the 1500 at the Bison Outdoor Classic. Temple’s Millie Howard (4:16.81) bested Penn’s Maddie Villalba (4:16.83) by .02 to post the fifth-best time in the nation so far this season. Sticking to field events, Virginia Tech’s Rachel Baxter is fourth in the country in the pole vault after a 4.45m showing (14-7.25) at the Tennessee Relays and Mississippi State’s Logan Boss is now fifth overall in the high jump (1.83m, 6-0) after a victory at the Crimson Tide Invitational. Alabama’s 4×100 group also posted the sixth-best time so far this season (43.63) at the Crimson Tide Invitational while Kentucky is fourth in the 4×400 (3:30.81) after winning at the Tennessee Relays. The best performance on the men’s side came from the 4×400 unit from Central Washington after the group posted the eight-best mark of all-time in DII history with a 3:03.85 at its Wildcat Invitational. The time now leads the nation. Another standout was Josh Boateng of Texas A&M-Commerce who became the sixth-best performer of all-time in the discus (60.77m, 199-4) after picking up a victory in the event at the East Texas Invitational. There was a good battle for the 100 crown at the Gamecock Invitational as Widchard Guervil of Tusculum outran JJ Sherman of North Greenville by .01 seconds to take the DII lead with a 10.31. The two finished fourth and fifth overall, respectively, against a field that included DI and professional athletes. Hillsdale’s Jared Schipper took the lead in the pole vault after winning at the Hillsdale Invitational with a best of 5.40m (17-8.5). Central Missouri‘s Jan Jansky is right behind in second after going for 5.31m (17-5) at the David Suenram Gorilla Classic. The best showing on the women’s side came from Lincoln (Mo. )’s Rene Medley who posted one of the all-time best all-conditions times with a 11.33 wind-assisted 100 to take the victory at the Gourley Invite. It is the best mark ran so far in DII this season. Emily Presley of Missouri Southern is now atop the nation in the pole vault after jumping 4.27m (14-0) at the David Suenram Gorilla Classic. Grand Valley State’s Hanna Groeber ran the nation’s second-best time with a 10:23.52 in the 3000 steeple at the Bison Outdoor Classic. The showing placed her second in the event against a field of DI athletes (unattached teammate Sarah Berger won the event at 10:06.31). Caroline Lewis of West Chester also moved into third overall in the heptathlon after she posted 5,085 points at the Mondschein Multi. Zak Dysert of Baldwin Wallace etched his named in the record books as he became the 10th-best performer of all-time in the hammer after a best toss of 64.21m (210-8) to win the DIII All-Ohio Outdoor T&F Championships. The All-Ohio Outdoor Championships featured a ton of standout performances as Jordan Leverette of Baldwin Wallace posted the top time in the 200 (21.07), Alex Dimon of Marietta took the DIII lead in the 110 hurdles after a 14.28 win and Cwinn Febus of Otterbein is the new No. 1 in the 400 hurdles (52.61). It was a showdown for the top spot in the 5000 at the UW Platteville Invitational between Darin Lau of Wisconsin EAU-Claire and Mason Wicker of Cornell College. Lau ended up prevailing after posting a 14:21.81 with Wicker in a close second at 14:24.66. David Kornack of Wisconsin Eau-Claire also posted the top mark in the shot put (18.20m, 59-8.5) at the same meet. Noah Falasco of RPI is now ranked second in the nation after he ran a 3:49.05 in the 1500 at the Bison Outdoor Classic. His teammate Grant O’Connor is also second in his event after he posted a 29:41.45 in the 10,000 at the same meet. Other top showings including the new No. 1 in the 4×400 in Mount Union (3:13.99) and Ryan Njegovan of Aurora who is second in the discus after throwing 52.75m (173-1) at the Triton Invitational. Even though no times entered into the record book doesn’t mean it wasn’t a great weekend on the women’s side of things. George Fox’s Sarah King tops the country after she ran a 2:09.83 in the 800 at the Pacific Luau Invitational while Redland’s Jessica Fields is No. 1 in the 400 hurdles after a 1:01.77 at the SCIAC Multi-Dual. Oliva McDaniel of Linfield also took the lead in the pole vault after winning the Pacific Luau Invitational with a best of 4.00m (13-1.5). It was a good battle once again in the 1500 at the Bison Outdoor Classic between Emily Forner of Allegheny and Elise Ramirez of Geneseo. Forner ended up taking the top prize by just over a second with a 16:33.01 showing. They are now the No. 1 and No. 2 ranked athletes in the event. Other top performers were seen from Dani Bland of Emory (second in the 200, 24.73), Malya Foster Daniels (second in the 400, 55.61), Caelyn Reilly of Johns Hopkins (second in the 10000, 34:56.05), Tasha Freed of Johns Hopkins (second in the 3000 steeple, 10:45.30), Fatima St. Hilaire of Regis (second in the long jump, 5.74m) and Alison Beeman of Dubuque (third in the 100, 12.13). SUNDAY NIGHT UPDATE: Avery Maillet of CCNY is now second in the long jump after going 5.78m (18-11.75) to win the event at the Coach O Invite and Cornell College’s Mason Wicker posted the fourth-fastest 5000 in DIII this season (14:26.66) at the UW-Platteville Invitational.